Polonium was discovered by the spouses Marie and Pierre Curie. It is named after Poland, the native land of Marie Curie, the first woman to win the Nobel Prize. Polonium, being a highly radioactive and toxic element, needs to be handled very carefully with special equipment, as even milligram or microgram amounts are very dangerous. 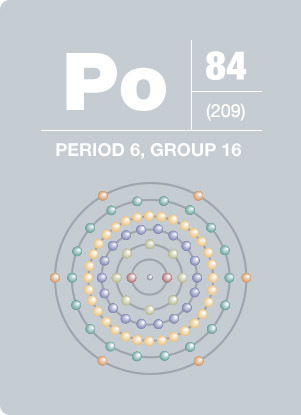 The maximum amount of polonium that can be ingested by the body is about 6.8 x 10-12 grams. Polonium is used on brushes that eliminate dust that has accumulated on photographic film. It is also used in space satellites as the source of thermoelectric power.